J Crew is having one of their great sales. In addition to already great markdowns, they are providing an additional 20% off the lowest ticketed price that ends in $___.99. I just picked up the fantastic Goodwinn Purse at the Vancouver location on my lunchbreak, it was unfortunately the last one but I did notice there were still some available online and the bonus, online, it's an additional 25% off with the code: SHOPNOW and free shipping until end of today, at checkout. 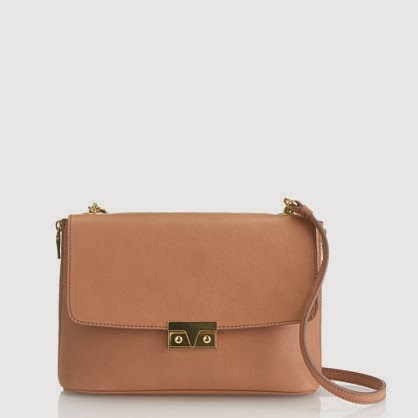 The strap length is perfect for the shoulder but will extend into a cross-body style. The leather smells and feels amazing and the inside is orange, which is one of THE colors for fall 2013. It's a perfect business / weekend purse, which I'm so excited to pull out with so many different outfits because of the neutral base of the purse. You can find the Goodwinn here and make sure to browse all of J Crew's other amazing pieces while you are visiting their site.